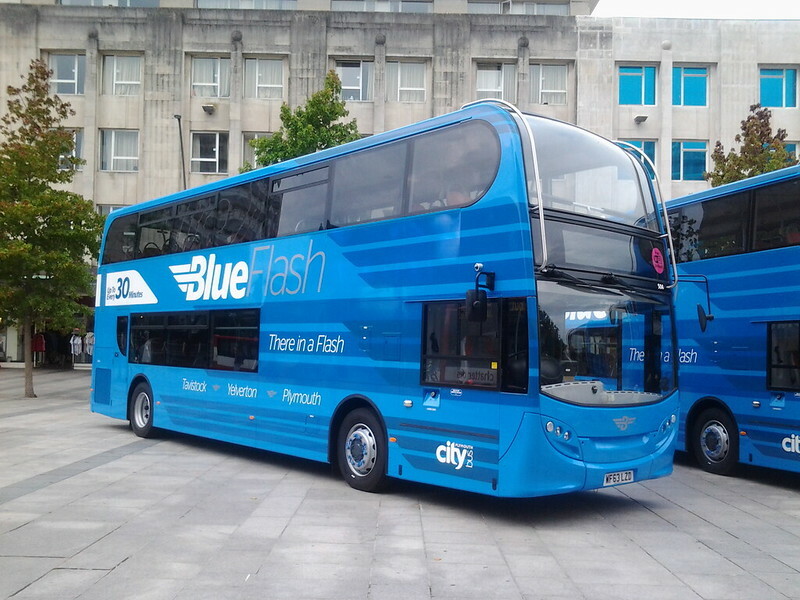 In the battle for Tavistock passengers it will help that Citybus’ Blue Flash certainly stand out. "In a flash" is a bold claim since their route takes 49 minutes, the same as First. I guess its a marketing ploy to highlight the fact that they are direct services. Many of the journeys at present take considerably more than 49 minutes. Of course soon First will also be running most of their routes direct so the time difference will be less significant. They do look VERY SMART. Thank goodness for a livery that follows the basic lines of the bus, which is essentially a rectangular block with windows. So much more dignified, eye catching, yet racey, compared with recent illogical styles the insist on breaking up the bulk with diagonal lines and swirls. Very smart. As a former Badgerline Group managment trainee placed with Western National some 20 years ago the latest developments in Plymouth will be followed here with great interest. I doubt it was in the designer's mind, but does anyone else see a hint of the old WNOC "winged wheel" logo in the arrowed B on this livery? Less so in the large version, but the smaller ones between the place names drew my eye. I am not sure about that - but the overall stripes do remind me of a long-gone NBC semi-coach, or limited stop bus, livery. Now that is very blue! I like it, although, for me, it's just a little let down by the way the stripes finish so abruptly around the front offside corner. The other stripes all have nicely shaped ends, so that this looks like an unfinished repair. These buses will certainly stand out, though. Blue Flash to Tavistock, Red Flash from Barne Barton to Plympton – so where are Green Flash, Purple Flash and all the rest going to go? 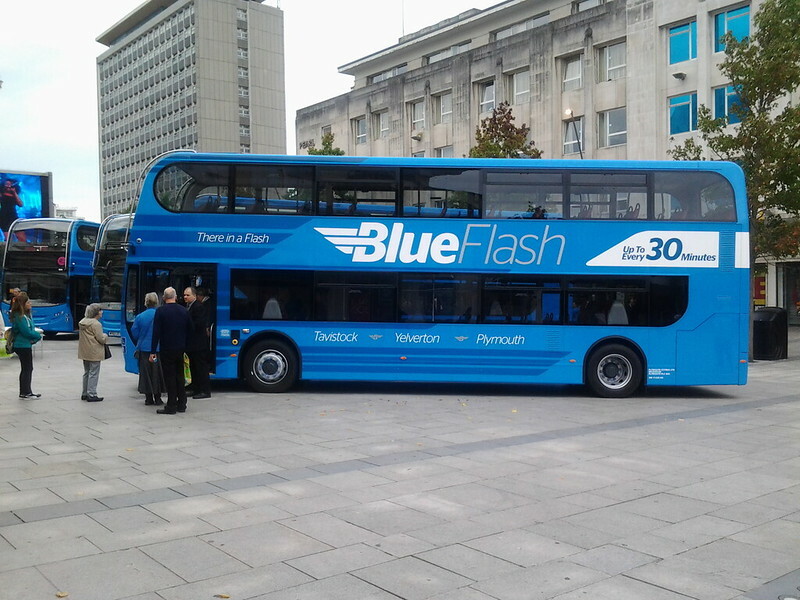 Given that the objective is to remove First from Plymouth – perhaps achieving it without paying anything as Stagecoach did in Barnstaple – which are the next main corridors in line? First’s network out of town is pretty thin now – apart from Tavistock, all they have got in Devon is the 93 and the Dartmouth town service and Cornwall is down to Torpoint, Saltash and Callington. Western Greyhound are quite capable of seeing them off on the 76 and Kingsbridge is a long way away, so my money is on Saltash and then possibly Plymstock. Shame the plympton ones couldn't have wifi! New First timetables online... as expected 15 now serves Roborough and Woolwell not Estover/Mainstone, every 20 mins Mon - Fri and Saturday AM, 30 mins Saturday PM. All 83's via Milehouse every 20 mins Mon - Sat, 86 via Mutley peak times Mon - Fri and evenings/Sundays. 48 also on Sunday now via Mutley. 3a Every 20 mins, Citycentre, Peverell, St Pancras Ave, Honicknowle, West Park, St Budeaux, Citycentre loop (both directions) This beats Citybus in these areas! New service 6 to Efford/Lipson every 15 mins and new service 2 to cover Plymstock. In the main a positive response to Citybus attack I feel, they should retain most customers in Tavistock etc, with 3 fast buses can hour compered to Citybuses 2 and gain new ones with cheaper fares in Plymouth. wrong! we are waiting for another 12 E400's. the extra 4 that were ordered for tavistock but were delayed, and the remaining 8. out of the original batch of 8, 4 have been sprayed blue for tavistock. so all the outstanding e400s will be red and will go on service 21/21a. hope this clears things up. I'm going with what the latest Buses mag states & that article said 16 were due in total. If they are going on the 21/21A, Barne Barton seems an unusual destination for a premium service. I wonder if the plan is to put the 43B into Barne Barton and make the 21/21A a cross-city service from Saltash to Plympton. Plymouth Citybus are missing a trick; it's all very well launching the service in Plymouth city centre, but apart from some red timetable cases and one advert in the local paper, hardly anyone in Tavistock knows this is happening. How do I know this? I live here! Talk to parents at school, friends, people around the Town and few people have heard of this new service. Where is the launch in Tavistock or leaflets through the door? Fab buses, but not much good if they run empty. Once they start seeing the buses I imagine they will turn a few heads. Unfortunately the PCB logo is quite small so people might not know which website to go to for more details! These look like some impressive vehicles, but can't help thinking they may be somewhat wasted on the Tavistock route. With First beginning to stir in the area and with the 83 having more departures not to mention running in the evenings and on Sundays along with being able to connect on local service 89 and with their competitive pricing structure I can't see First being dislodged. I think First need to look at a revised bold image for Plymouth with some local route identities - they are doing this now in more and more places. First have tried route identities before - remember the colour coding for each of the main routes. They still have some route-specific liveries, too - the Torpoint services, the Park and Ride, the 93 and Tavi Lynx, although the first two of these are now going. The trouble is that First don't seem to have the strength of management to keep the buses on the route for which they are painted. A year or so back I saw a 93-liveried bus on a school contract in Tavistock and on one Saturday two Torpoint-liveried buses on a private hire in Plymouth while the service was left to old step-entrance buses. Even now, the mauve Tavistock buses seem to find their way to Callington quite frequently and are used on city services too. First's new livery is less than striking - a sort of insipid grey and mauve. They also seem to use poor quality paint, which means the buses start to look tatty quite quickly. Citybus seem to look after their vehicles much better and take care over their presentation. When Western Greyhound were using double deckers on the Callington service, they turned heads as I am sure the Blue Flash buses will. Citybus have done a good job with these Enviros. Where will most of the passengers come from? Should there have been a launch in Tavistock? gone in a flash - PCB's 2013/4 profit margin and here in a flash - financial losses sustained in competing with First. How long have PCB given this to break even and turn a profit? Do they envisage short/medium term losses upon start up? And First's reduced fares are going to give them higher revenue than they currently have, are they? High enough revenue to turn a loss into a profit? That's a big ask. No way is this battle straight-forward or predictable. Yes, of course, PCB will anticipate a period before break-even. So will First on their new routes. You can't write off either at this stage. Is that First's primary objective - or is it to teach anyone out there a lesson - that they aren't just going to roll over when anyone starts competing with them? Could be a small investment in the grand scale of things in Plymouth to protect their revenues everywhere else. I see that the whining has started in Somerset now that they have started to give Webberbus a taste of their own medicine. If only. First may be cutting out loss-making routes but at the same time they're introducing the unknown quantity of new routes which may or may not become profitable plus they'll be facing competition from Citybus on key corridors which could affect routes that are currently profitable. First aren't going to have an easy time of turning themselves around. Besides, if Citybus do end up as the only operator in Plymouth why should that automatically mean fare rises and route cuts? It's not the case in Brighton where Go-Ahead has increased frequencies and fleet size year on year for eons without pricing everyone off the buses. Please provide your evidence for why it should be any different in Plymouth. But this time, Richard Stevens is the MD. There's no Paul McGowan or Chris Hilditch to carry the can this time, it all falls squarely on him . But you never know with competition, if done right it stimulates the market and means more people overall catch buses. Go Ahead getting a monopoly will be very bad news for Plymouth. "stagecoach did not listen to Richard s when he wanted them to hit first." In case you hadn't noticed they've done just that. ;-) Although admittedly Go-Ahead are doing it in a much bigger way. I agree. The near-libellous personal attacks are not necessary. Let's get this straight. Stagecoach did not enter North Devon to attack First. They entered North Devon on the back of First throwing in a substantial number of tendered services which they did not then win back as Stagecoach won them. Stagecoach, having won sufficient work up there to open a sizeable depot, found they could spread their overheads and use buses between school contracts to try running commercially against First. First then tried running open-toppers between Torquay and Paignton and Stagecoach retaliated with the X45 Paignton to Plymouth service. Over in Plymouth, it was First who tried to wreck the sale of Citybus by registering a new city network which ultimately failed. Now First's constant cutting back, failed Plymouth sale and the statement about being in 'near closedown' mode has left them vulnerable and you really can't blame either Citybus or Stagecoach for moving to protect themselves by cherry-picking what's left of First's operations. It would be foolish of them not to have done so. Surely we can discuss the situation without resorting to mud-slinging and personal attacks? Prehaps one thing CityBus should consider is a Yellow Flash into Mount Batten:, City - Pomphlett Road - Dean Cross Road - Broadway - Mountbatten Way - Hooe - Mount Batten. This could take the traffic of First's 2 and wipe First out of Plymstock (im saying could, not that it would). Why not then use Green and put some wifi buses on the Ivybridge route (its direct and quick using the A38!). This would leave Blue: Tavistock - A386 - City, Red: Plympton - Cross City - Barne Barton, Yellow: Mount Batten - Plymstock - A379 - City and Green: Ivybridge - A38 - City. All major trunk routes covered.